How to choose your exam pieces. Should a student choose for himself or let the teacher decide his music exam pieces? This week's topic comes from yet another question from one of my subscribers. Firstly, let me thank you Rohan for your question and by the way, if anyone else has a question they would like me to cover in a future post please leave a comment below. Secondly, I want to thank those of you who took my poll this week where I asked whether you chose the pieces yourself or your teacher chose for you. Interestingly, the vast majority of you, 72% said that you chose yourself. There were also some thought provoking comments below the poll. "The teacher plays all the songs for me, and I choose." ...and this is exactly what I do with my students. "I told him what pieces I liked and he told me what he thought I would be good at and we go from there. " Maybe a student with smaller hands might avoid a piece with big stretches. With this in mind I do tend to point out to my students the areas of difficulty in EVERY piece, but still I like them to decide mainly on which one inspires them the most simply from listening to it. I have had students who see one piece is a page longer and immediately decide against it before they realize that very often this piece includes a lot of repeated sections and doesn't involve as much learning as it first appears. I will leave you with a question related to this picking your favourite piece idea. How many of you start learning your pieces with the, lets call them, more fun pieces, i.e. 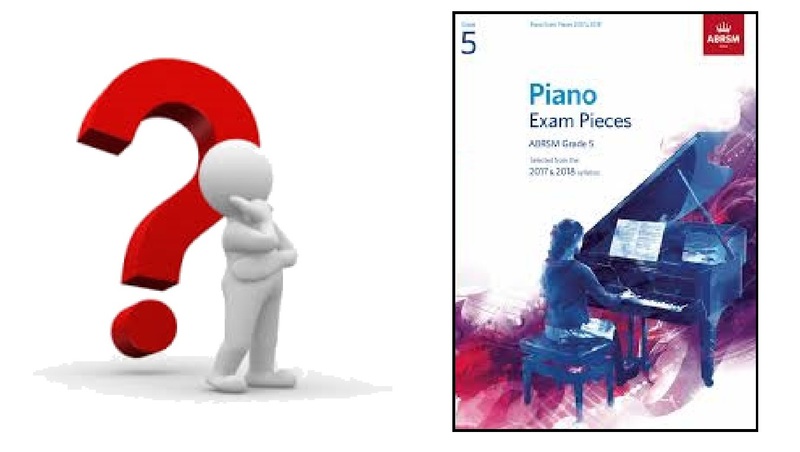 the C list pieces in ABRSM exams or do you have a different criteria for choosing which piece you start learning first. Please let me know in the comments below. Interesting! I remember my teacher picking my pieces when I was learning violin. Now I'm an adult learning piano, it's great to choose my own. Generally I listen to the CD all the way through with the music and highlight the ones I really like. For the current syllabus 2017-18 that was all three A pieces, two B pieces and only one C piece. (I'm not so keen on the modern stuff). From the multiple selections there'll be one that stands out, so I'll focus on the three 'main exam' pieces but also learn or play through the others. They have to appeal to me and be a good mixture; not all too easy or simplistic sounding or I'll get bored; not all too technically demanding or I'll lose heart. Thank you Ruth for your input.So what grade are you studying now?